Indian Nationals residing in India or abroad. People of all ages can participate in the online auditions. FremantleMedia in association with mobile video streaming service provider ZengaTV and YouTube MCN One Digital Entertainment have launched the digital talent show India’s Digital Superstars, a first of its kind talent competition on a digital platform. Musicians, DJ’s, comedians, dancers, mimicry artists, contortionists, singers, jugglers and acro gymnasts among other performers should have the talent to entertain viewers and have a video to match their talent. The desirous candidates are required to shoot their talent video on any recording device like a phone, handycam or even a webcam and upload them on the official website or through India’s Digital Superstar app. The auditions for the show began on the January 19, 2015 and are expected to end in the Month of March, 2015. Viewers play a vital role in taking the competition forward. The more hit the video is amongst the viewers, better are the chances of winning the contest. The candidates interested in participating in India's Digital Superstar 2015 have to submit the video showcasing their talent through online medium. 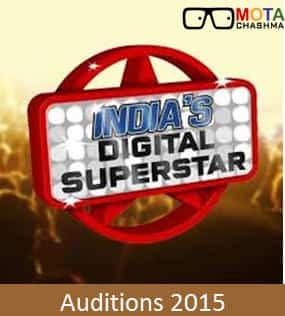 There are no ground audition for India's Digital Superstar 2015. Fill up the Registration Form: Candidates are required to Sign up and fill the Registration Form at the official website. Upload youtube link: Thereafter, they have to upload their YouTube video link along with a video description and other details like name, city, email etc. No limit on Number of Entries!- During the Audition Tenure of 9 weeks, the participants can upload as many videos of the talent they wish to showcase. The uploaded videos will then be judged by the team of experts. The videos will be made available on the IDS website, IDS apps, YouTube and Zenga TV for viewers to watch. Points will be allocated to the videos based on the number of views and likes they gain across YouTube, Facebook and ZengaTV. The top five scoring participants will become finalists along with five others chosen by the judges, bringing the total to 10 finalists. Out of the 10 selected finalists, ‘Digital Superstar’ will be announced in the 10th week, during a Live event held in Mumbai. The winner of the show will be given a contract worth Rs 20 lakh from Fremantle Media and One Digital. distribution subsidiary of Bertelsmann's RTL Group, Europe's largest TV, radio, and production company. During 2009, it established a new on-the-ground production unit in Mumbai, India. One Digital: One Digital Entertainment is India's Leading YouTube Certified Premium Multi Channel Network. They help in creating and discovering amazing content on the strongest YouTube Network by working alongside some of the finest artists & content creators around. There are no Ground Audition, only online auditions.